What might Garnet’s Universe have taught us? We certainly saw a more caring side of Garnet in Garnet’s Universe. We also learned that Steven has a very large set of cartoons to draw inspiration from when constructing Garnet’s imaginary adventures, but as far as real lore we’re left looking. CoinOpTV has posted a clip from next week’s episode, Watermelon Steven. We heard a lore fact weaved into this one, so here’s to hoping for more from the full episode. While there’s a bit of difference between what we asked for and what we got, we’re still feeling fulfilled by the way Garnet’s Universe ended. What we’re not so excited to see is that Steven seems to have drawn more from his knowledge of Dragonball than of Garnet when telling his tale. Garnet is still as mysterious as ever, and we’ve learned only the barest facts from this episode. Did you see the preview for Garnet’s Universe? Looks like we’ll be getting to see more motherly Garnet, as opposed to the usual aloof Garnet. Along with a very outrageous tale by Steven, complete with a more exaggeratedly cartoony style, with regard to both visuals and its story. Steven will probably make up an epic journey for Garnet (he apparently has given her an accompanying adventuring party, complete with Ronaldo as the priest), only to have Garnet tell him that her day was much more mundane. That would be the predictable plot, anyway, but the show’s thrown us plenty of curve balls before. We’d love to see a “Why did you ask me where I’ve been if you already knew?” with whatever passes for a wink from Garnet. The big question: do we learn any hard facts about Garnet tomorrow, or will we be picking through the story looking for clues about Garnet based on what Steven’s picked up from living with her and chosen to put into his story? While we hope for the former, we likewise must prepare for the latter. Alexandrite is definitely an interesting fusion. Here’s to hoping we learn more about her later. In the mean time, check out this drawing of her on rekka-jetti’s DeviantArt page. This is going to be an interesting one. Steven was on quite the roll with discovering powers, and it looks like he’s going to add another one to the list. Check it out on November 20, at 6:45 PM EST. Steven discovers a new power when he grows a patch of Steven-shaped watermelons! 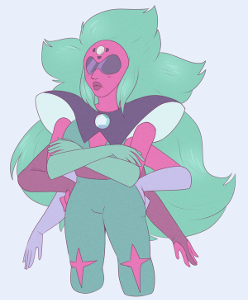 Alexandrite isn’t like other fusions (at least the two-Gem fusions we’re familiar with, Opal and Sugilite). Being forced to eat food, Pearl desperately wanted out of the fusion. Her need was so great that we’ve made Let Me Out our song of the week. 6:45 PM: Keep Beach City Weird!